Sibcy Cline Realtors’ Dayton offices received special recognition from the Culture Works arts organization for its increase in donations for 2014. 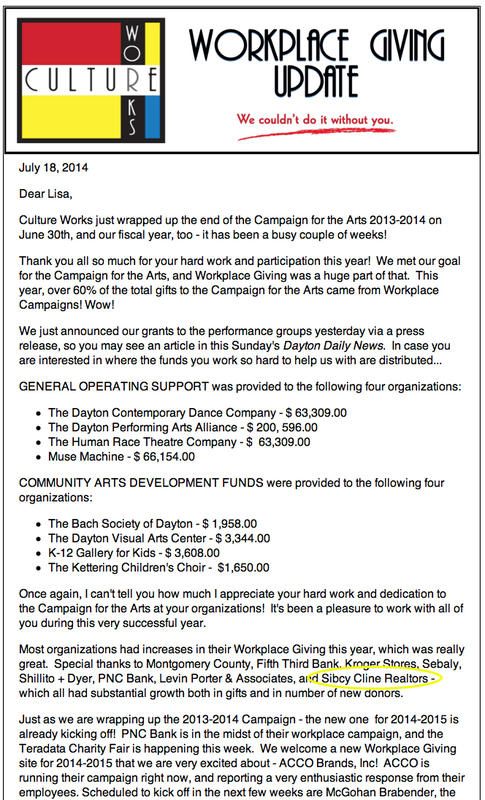 The February 2014 campaign in Dayton saw a 40% increase in donations from agents and employees. The Dayton offices kicked off their arts campaign with a Mardi Gras party led by Sibcy Cline campaign co-heads, Claudia Adelhardt and Lisa Fix. This kick off was well attended by Sibcy Cline Dayton agents and employees as well as Bob Mahoney (General Sales Manager) and Robin Sheakley (President of Sibcy Cline Relocation Services). Culture Works receives 60% of its funding from workplace giving campaigns. This entry was posted in Branch Office News, Communities, Events and tagged Culture Works arts organization, Sibcy Cline Dayton by susanaknabe. Bookmark the permalink.